Professor David Cameron-Smith delves into why protein is such a vital component of a healthy diet. Proteins have amazing functions. Gone are the days when protein was viewed simply as a means to deliver amino acids to build and repair all cells of the human body. Proteins are so much more. Protein is found to some extent in almost all foods. Protein-rich foods include meat, eggs, legumes, beans, grains, tofu and nuts. Each of these foods contain an extremely complex array of differing proteins. Some of these proteins contain several thousand amino acid building blocks and others are just a few amino acids long. These proteins add to the taste of food, with the taste receptors picking up the signals that can vary from sweet, to sour, through to the long-lasting meaty taste associated with foods like mushrooms. It is the underappreciated role of proteins in food that turn a good meal into a great meal. The stomach starts protein digestion by breaking the proteins apart with acid. The real action commences when the proteins pass into the small intestine and the digestive enzymes break each of the 20 amino acids found in food protein. Each amino acid has a function, but the body can mix and rebuild 11 of these amino acids. Only nine amino acids have to be obtained from the diet, these are known as the essential amino acids. As the amino acids are released by digestion and are transported from the small intestine into the body, they trigger the release of a range of hormones and activate gut nerves. The hormones and the nerves communicate to the appetite centres of the brain that food has been eaten. Protein is then the most filling or satiating of the food we eat. When activated, the hormones and nerves keep the brain in neutral mode when it comes to food, ensuring we feel fuller for longer. Proteins are good mood foods and these sample pathways are important for our mood. The amino acid tryptophan is converted into the brain regulator, serotonin. Serotonin is one of the brain’s reward, or positive pathways, activating our positive mood neurons. All tissues of the body use amino acids to maintain the function and health of our cells. If you are exercising, amino acids are necessary for recovery. In sports with high contact, muscle damage or where strength and bulk are required, the first six hours after exercise are vital in the repair process. Eating or drinking protein-rich foods speeds recovery as amino acids are required not only to rebuild muscle proteins, but also to trigger the repairing and rebuilding machinery faster. Amino acids can also be used for energy. When there are more amino acids than the body requires, the extra amino acids are most often used as fuel, powering metabolism. Protein rich foods should be selected that are either rich in minerals or dietary fibre. Choose your proteins to provide added health benefits, such as beans, pulses and nuts, and avoid proteins that are associated with saturated fat, including burgers, meat pies and many forms of junk food. Protein variety ensures an adequate mix of all the essential amino acids. 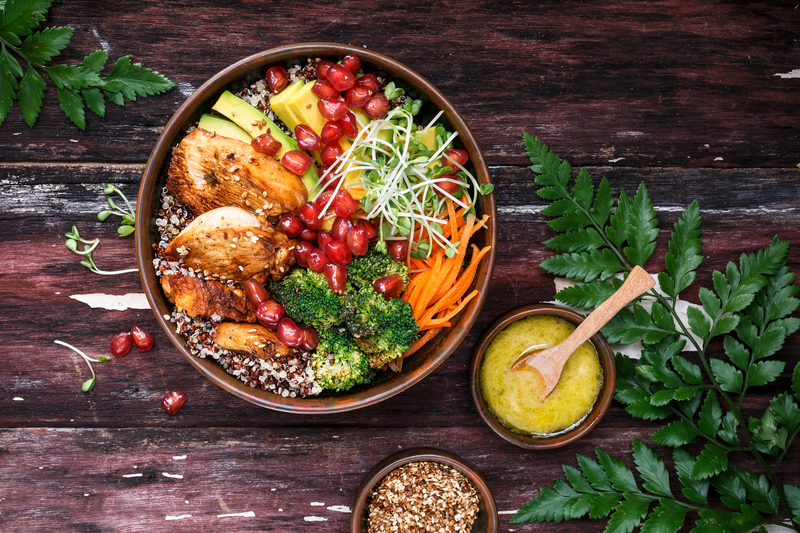 For vegetarians, this means careful meal planning and the dedication to eat a wide mixture of complementary high protein foods, including tofu, quinoa, corn and legumes. Excessively high protein diets can be detrimental for long-term health. Ensure there is a balance between all macronutrients to give fuel, minerals and dietary fibre for optimal health. Adequate protein is typically no more than 100 to 150 grams each day and should include at least five serves of vegetables and at least two fruits everyday. If you are strength exercise training, fuel up on protein in recovery to provide speedy muscle repair. Some simple options include a low fat smoothie, a cup of fruity yogurt, a chicken breast and vegetable stir-fry, a grilled salmon salad, a mushroom omelette or a lean steak and steamed vegetables. View more informative articles by Professor David Cameron-Smith here.